Three people have been shot dead at their family home in Thailand. 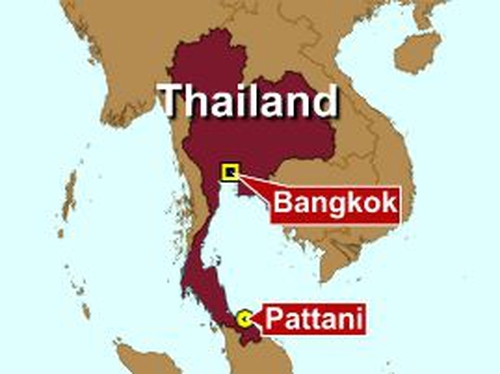 Unknown assailants broke into the victims’ home in Pattani province late on Thursday and shot them in their living room, police said. The victims were a 46-year-old rubber tapper, his wife and their 17-year-old son. Police blamed separatist insurgents bent on fuelling sectarian violence between local Muslims and minority Buddhists. In a separate incident, a small explosive hidden in the basket of a motorcycle exploded outside a market wounding two civilians and two soldiers. More than 3,700 people have been killed in almost six years of bloody violence in Muslim-dominated Pattani, Yala and Narathiwat provinces. The government has deployed a massive security contingent in an unsuccessful attempt to crush ethnic Malay rebels thought to be fighting for self-rule in the once-independent region. The area is just a few hours from some of Thailand's most popular tourist destinations. The attacks come a few days ahead of a visit to the region by Thai Prime Minister Abhisit Vejjajiva and his Malaysian counterpart, Najib Razak, who has advocated a degree of autonomy for the three provinces as a way of stopping the violence.